Brian Suratt's surf school, Sunset Suratt Surf Academy, is TripAdvisor's number one rated activity in Boat Tours and Water Sports in Haleiwa, Hawaii. 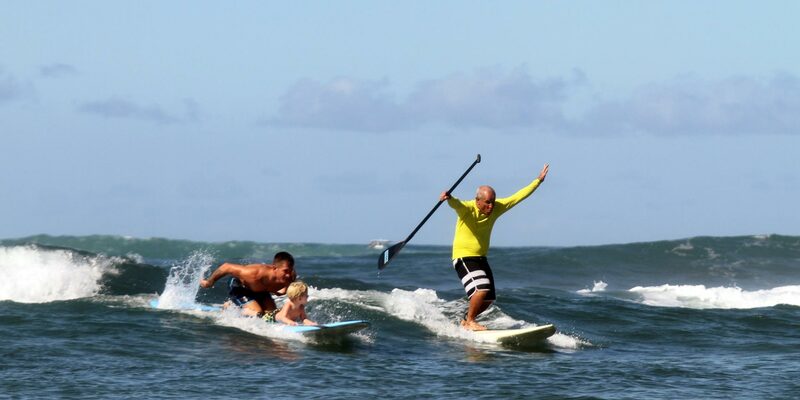 Ask any lifeguard on the North Shore where to take surf lessons, and they'll tell you, "Go see Uncle Bryan." In an extremely aggressive market, Bryan and his company have managed to stay ahead of the competition by employing great instructors, providing outstanding service and pushing their web game hard. After great success with the website that I initially developed for the company in 2009, and again with the online booking system that we set up in 2010, the company requested help redeveloping the static HTML website to a mobile platform ahead of Google's emphasis on responsive design, which would go into effect in March 2015. I recommended migrating the content of the existing site to a new site built on the WordPress platform. The reasoning was that it would fulfill the responsiveness criteria, maintain currency in a shifting web technology field, and provide new tools to make the site easy to manage down the line. Because of the choice of platform, we were able to achieve the required goals quickly and inexpensively. Uncle Bryan and his crew have been great to work with. A website is really only as good as its content, and one thing that Sunset Suratt Surf Academy did from the start is provide great imagery to work with. This not only made the development process relatively quick and easy, but also has paid huge dividends in terms of online conversions. The lesson? If your business is worth investing in, great photography is worth the expense. If you're ever on the North Shore of Oahu and seeking to take surf lessons, I would highly recommend looking Uncle Bryan up. You can view his surf school's website at SurfNorthShore.com.